Some of life’s most sought-after items are those that can only be perfected by time. The best bottles of wine or whiskey require decades of aging, the most exquisite cheddars rest for years to achieve their flavors, and dry-aged beef simply melts in your mouth. What’s more, the concept of “it gets better with age” is hardly limited to the pantry — it also extends to your finances. For instance, a well-aged savings bond can provide solid profits, and you can amass a very healthy portfolio with just a little compound interest — if you give it enough time. Even your consumer credit score tends to improve with age. According to recent studies of the average credit score by age, the average American’s credit scores get better over time, with each generation having higher credit scores than the generations after it at any given point. 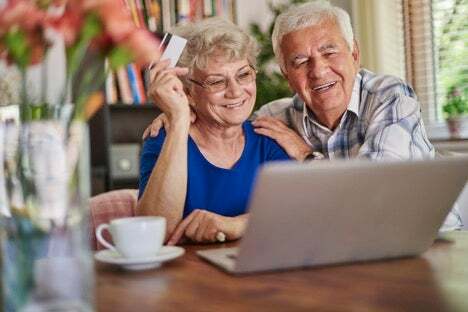 In fact, the studies found that those aged 60 or older are twice as likely to have a FICO credit score above 720 than those under the age of 40. And seniors are almost four times as likely to have a 720-plus score than those consumers who are 30 years or younger — the majority of whom have FICO scores of 620 or lower. When looking at the data, your first assumption might simply be that your age is one of the many pieces of information that FICO uses when calculating your credit score, and leave it at that. But you’d be wrong. Your age doesn’t actually have any direct impact on your credit score (which means your score won’t automatically improve just because you have a birthday). That said, while your age doesn’t directly impact your credit score, the age of your credit accounts will have an important role in your credit score calculations. A long history of healthy credit behaviors can say a lot when it comes to proving to potential lenders that you are a creditworthy borrower, so FICO’s credit scoring models are going to factor it in. In fact, when calculating your credit score, the length of your credit history will count for a full 15% of your total score. Furthermore, FICO isn’t just looking at how long ago you got your first credit card; the scoring model will look at both the age of your oldest credit account, as well as the average ages of all of your accounts. And as far as FICO is concerned, the older your accounts, the better. But you won’t need to be eligible for AARP to score high marks for your average account age; the key is to start establishing good credit early in life. An average account age of six years is respectable, and an average age of nine years (or more) will net you the best results. So, an 18-year-old college freshman with a basic student credit card can be halfway to a solid credit history length by the time he or she reaches graduation. Some other aspects of your age may also influence your overall credit score, albeit in more nebulous ways — like the improved financial wisdom we all (hopefully) accrue with time and experience. Learning how to manage your finances will lead to a better payment history (35% of your FICO score) and, thus, higher credit scores. Along the same lines, simply traversing the various stages of life will bring opportunities to improve your credit score that may not yet be possible for younger generations. There are five separate factors that go into a FICO score calculation, most of which are easier to influence as you, well, grow up. For example, you’ll likely never make less money than when you first enter the workforce — and, nowadays, you’ll likely have a boatload of student loans to keep afloat. The career advancements that come from doing your time in the workforce — or, more specifically, the salary raises that typically accompany them — can help you pay down debt and improve the amounts you owe (30% of your FICO score). Moreover, some credit score influences are not yet financial priorities for younger consumers. Some of life’s milestones can come with installment loans that can improve your overall credit mix (10% of your FICO score), like using an auto loan to purchase a pre-owned minivan that fits the whole family or getting a mortgage for a long-awaited retirement condo on the beach. Regardless of what’s behind the correlation between age and the average credit score, the important thing to note when considering the studies’ findings is that averages are just that — averages. They are not all-encompassing, and should not define your financial efforts. Anyone can earn an excellent credit score, regardless of his or her age. Of course, it’s not only the young who worry about their age impacting their ability to achieve excellent credit. Those who have weathered a few financial storms may actually be worried about being too old to improve their credit. But, just as you’re never too young to start building good credit, you’re never too old to find ways to improve your credit score. For some consumers, working with an experienced credit repair company can help smooth the bumps in a rocky credit report, removing mistakes and unsubstantiated accounts. Be sure to choose a reputable company and research applicable fees before getting started. The best credit repair company for you will depend on your needs and your budget. You’ll likely also need to pay down your current debt, as well as work on improving your payment history. The newest information on your credit report often carries the most weight and most negative marks will come off your credit report in seven years. For those who have experienced a bankruptcy or other major financial issue, credit cards for bad credit can help establish credit after a discharge so you can begin rebuilding your credit score. In the end, the key to a good credit score is establishing credit, then maintaining that credit in good standing. With a little determination, a few smart financial decisions, and the power of time, anyone can achieve excellent credit. This entry was posted in Credit 101 and tagged credit report, Credit Score, FICO, payment history. Bookmark the permalink.